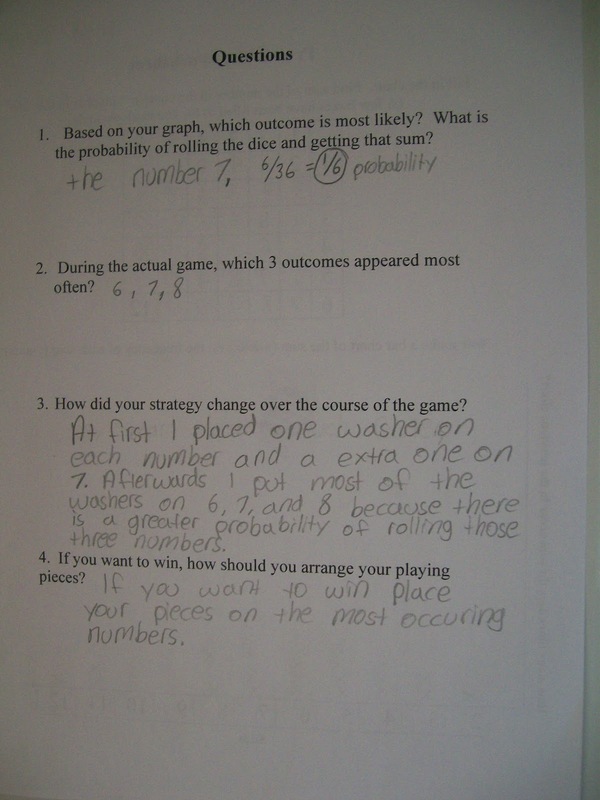 After my 8th graders finished their state testing, my cooperating teacher and I decided to plan a mini-unit on probability. 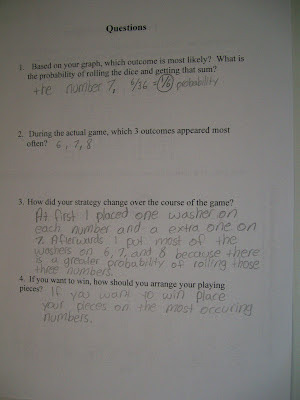 Probability is an 8th grade math standard in Oklahoma, but it is not tested by the state. To be clear, I did not make up this game. 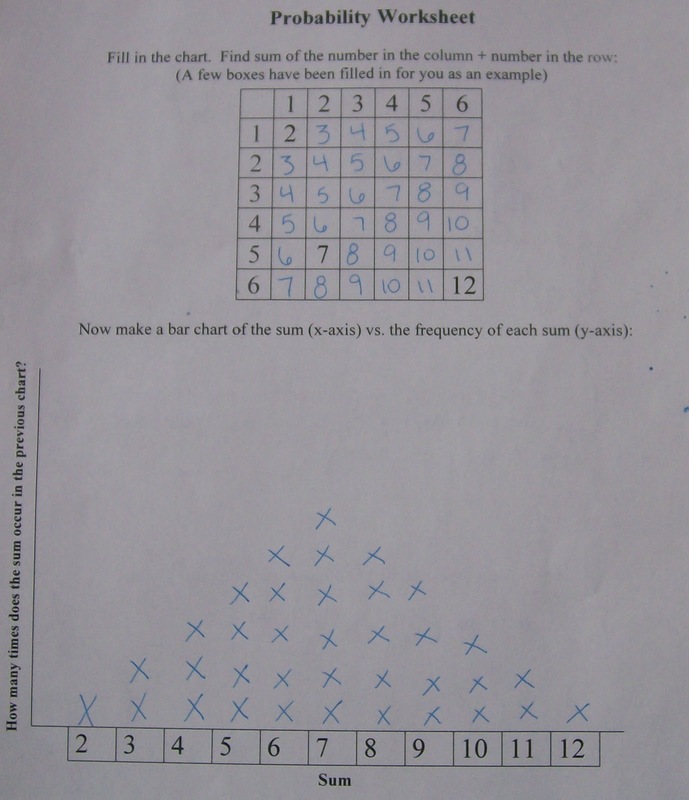 I discovered this probability game a few weeks ago on a (new to me) blog, Walking in Mathland. There, the game is referred to as Beano. And, each student is given twelve dried beans to play with. Knowing my middle school students, I decided that I didn't want to hear jokes all day long about the name of the game. And, I could just picture students pelting dried beans at one another. So, I modified the game to be played with twelve small game pieces. I had a bag of small washers that made perfect game pieces, but any small object could be substituted. Each student will need twelve game pieces. 1. Place your twelve pieces on the game board. You may place all your pieces on one rectangle or spread them out however you wish. 2. Roll two dice. Find the sum. 3. 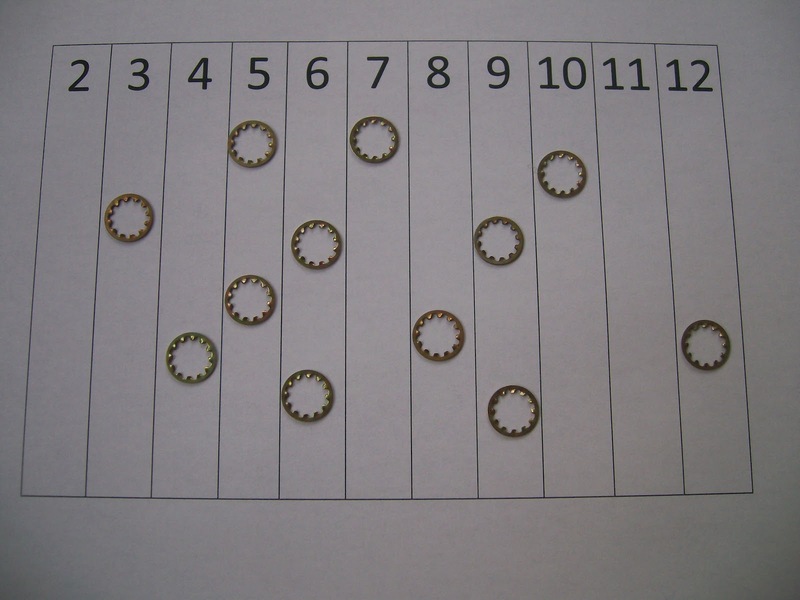 If you had a playing piece on the sum rolled, you may remove one playing piece. 4. Continue rolling the dice and removing playing pieces one at a time until one person empties their board. Step 1: Hand out game boards and playing pieces. Instruct students to place their playing pieces on the board. Go over basic rules. Step 2: Jump straight into the first game. I used the "Multiple Dice" feature from the Smart Notebook Gallery. Students will soon realize that their strategy for placing their pieces could be revised. Once a person has won, instruct students to think about their strategy for placing their game pieces. Remind them that this is a game of probability. Step 3: Play the second round. 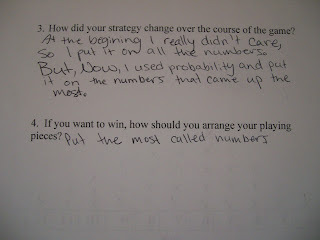 Step 4: Next, I told my students that I wanted to help them win this game. I handed out the worksheet posted on Walking in Mathland. Of course, I modified it slightly since we weren't playing with beans. Students completed the chart at the top asking them to list all of the possible sums that result from rolling two dice. 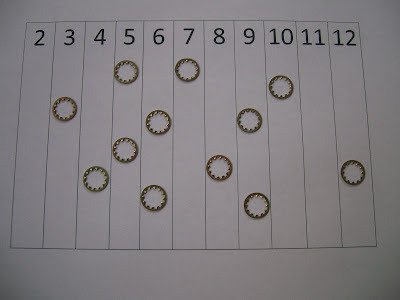 Step 5: Tell students to use this chart to help them place their game pieces for the third round. Play the third round. Step 6: Have students complete the bottom half of the worksheet. The instructions say to create a bar graph, but I had students ask if they could create other types of graphs. Of course! We had a short conversation about what types of data displays would be appropriate (another 8th grade math standard!). So, I ended up having students create bar graphs, line plots, and scatter plots. Step 7: Play again. By now, students start to realize that a winning strategy is to place their game pieces in a similar manner to the graph they created. 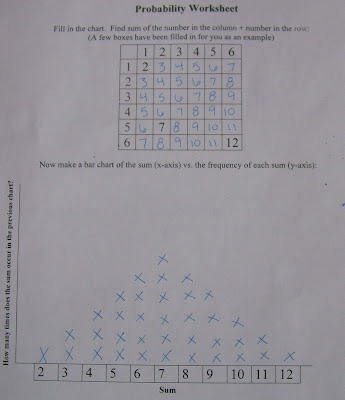 Step 8: Have students answer the 4 questions provided on the back of the worksheet. Step 9: Continue playing as time allows. My students really enjoyed this game. It was really a fun experience to watch them develop strategies for winning the game. 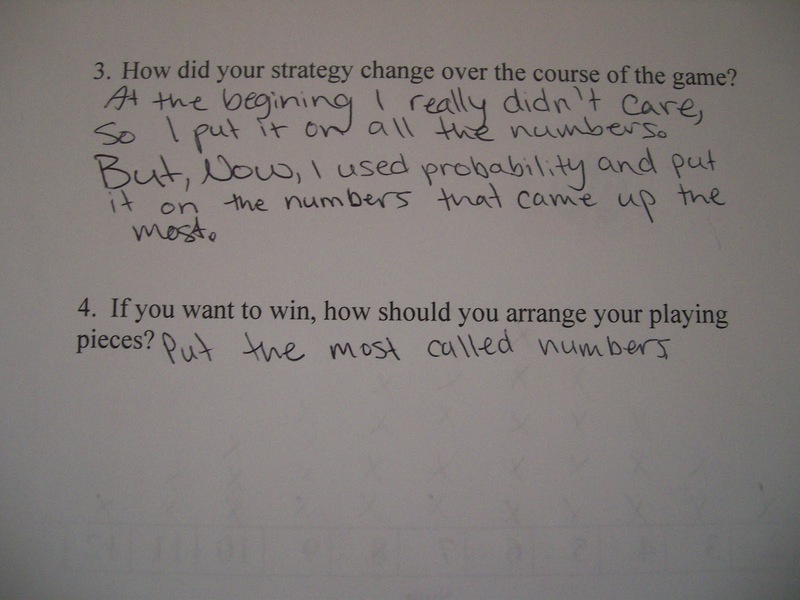 I had one student whose initial strategy was to place all of his twelve playing pieces on the number 12. He soon realized that the number 12 didn't appear much in the game. We had lots of opportunities to talk about the probability behind the game. We discussed the differences between theoretical and experimental probability. The students were fully engaged in the activity.